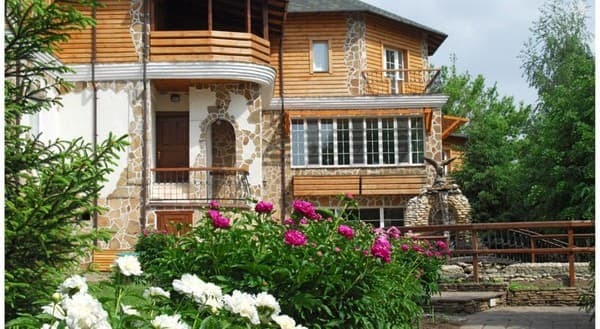 Hotel "Eagle's Nest" is located 26 kilometers from the center of Kirovograd, in a picturesque corner of the village Subbottsy. 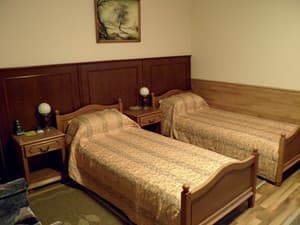 Hotel offers 7 rooms with all amenities. 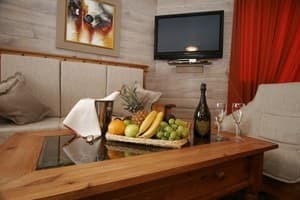 All rooms have mini bar, telephone, plasma TV, air conditioning. Wide infrastructure and service will satisfy exacting and demanding guests. 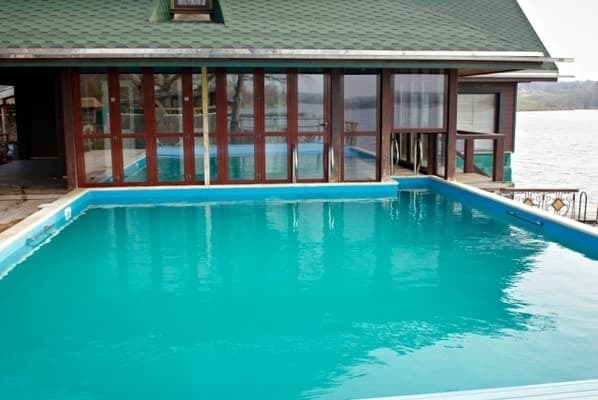 There are restaurant, summer terrace, barbecue facilities, a barbecue near the lake, boating and the raft and sauna complex: Russian and Turkish baths, swimming pool with an area for sunbathing, equipped with sun loungers. Free parking is available. Distance to the bus station in Subbottsy is 2 km. Description of the room: The room is for one or two people. 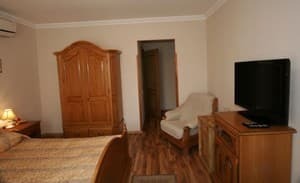 Furnished with one double bed. Combined bathroom with a bathroom, a cosmetic set, a set of towels. 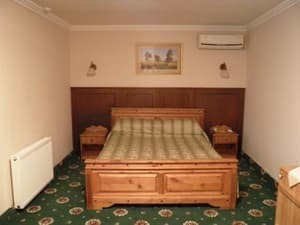 Description of the room: The room is furnished with two single beds. Combined bathroom with a bathroom, a cosmetic set, a set of towels. Description of the room: The room is for one or two people. The room is significantly different in size and layout from the rooms of other categories, designed in modern European style, furnished with exquisite furniture. 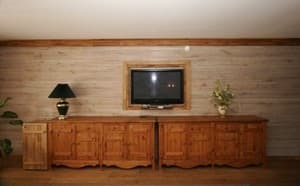 It is furnished with one double bed, a combined bathroom with a bathroom. Description of the room: The room is designed for one or two people and differs significantly in area from the rooms of other categories. 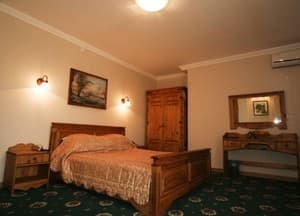 It is designed in modern European style, furnished with exquisite furniture (one double bed, complete set of furniture), a combined bathroom with a bathroom. Всё было супер .. место великолепное .. услуги на все 200% .. очень вежливы все и не в чём нам не отказывали ..
Children up to 7 years stay free of charge without extra bed. Additional bed + 100 UAH. 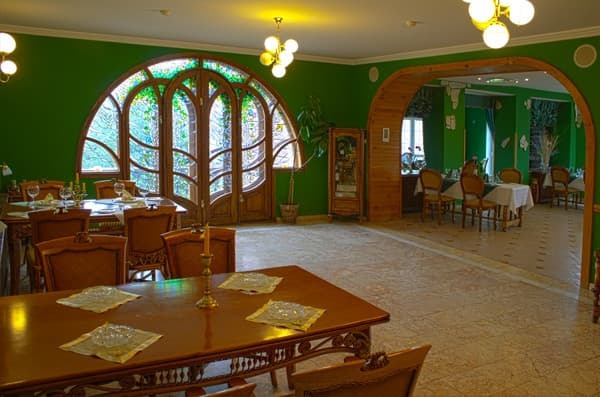 The restaurant of the hotel "Eagle's Nest", decorated in a traditional style, offers dishes of Ukrainian and European cuisine. 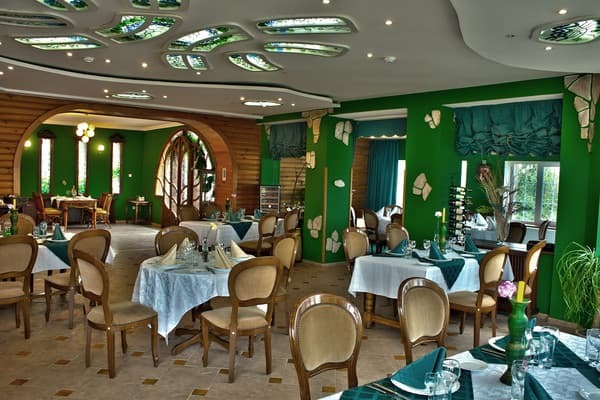 Restaurant and hotel complex “Orlinoe gnezdo” is located in a beautiful natural oasis on the shore of the river in Subbottsy village, a 15-minute drive from Kirovograd. The nearest bus station in Subbottsy village is 2 km. Distance to the bus station and the airport in Kirovograd is 22 km. The nearest railway station is 25 km from the hotel. The nearest bus station and railway station in Znamenka is17 km from the hotel. 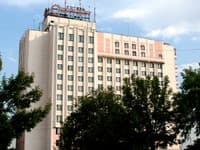 There is a big turn sign towards the hotel on the “Kirovograd – Znamenskaia” highway.